Home » Amphibians » Critta Cam: Dwarf Tree Frogs? 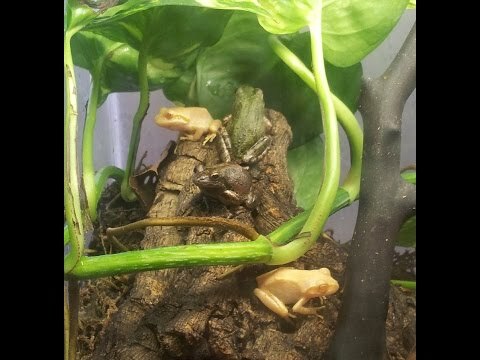 Critta Cam: Dwarf Tree Frogs? YouTube - Peter Birch discovers a small population of dwarf tree frogs hiding in a small patch of plants in his front yard. Facebook - Red Eye Tree frogs are one of the best looking animals on the planet. Josh’s Frogs is breeding a ton of frog species, including these. Check them out! YouTube - Tactical Veterinarian captures their Pacific tree frogs (Pseudacris regilla) in a variety of colors hanging out together in this short video. Frog Forum - Some stunning photography captures the neat coloration of a few tiny grey tree frogs from a member’s farm. TortoiseForum.org - During a rainy day a member takes advantage of the weather and films some tiny tree frogs and their distinct calls.